Mobile-geddon. Mobile-pocalypse. The biggest update in years. Call it what you want: On April 21 Google will be releasing an update to its algorithm that could have a big impact on your search engine rankings if you and your website aren’t prepared. The focus of this update is to provide a better search experience for mobile users. To accomplish this, Google will be “expanding [its] use of mobile-friendliness as a ranking signal.” So what does that mean in plain English? If your website isn’t mobile-friendly, your search engine rankings and ultimately your Web traffic could take a hit. This algorithm change has likely been in the works for a long time, as Google has made several announcements related to mobile devices in the past year, such as mobile usability tools, a mobile-friendly label in search results and even a mobile-friendliness test to give your site a pass/fail grade. If you’ve been hanging on to your old-school website design for the past decade, Google has officially given you a reason to upgrade in the next two weeks. If your site isn’t mobile-friendly, don’t panic, and definitely don’t pay someone from a spammy-looking “Your website is in danger” email to fix your site. 1. Run your website through Google’s Mobile-Friendly Test. If you get a green “Awesome! This page is mobile-friendly,” then you’re all clear. Skip to step 6. If you get a red “Not mobile-friendly,” then we have some work to do. If you manage your own website and were surprised to find out it wasn’t mobile-friendly, read on to the next step to see how to look for specific issues to fix. If you’re not the webmaster for your page or use a website provider, skip to step 3. 2. 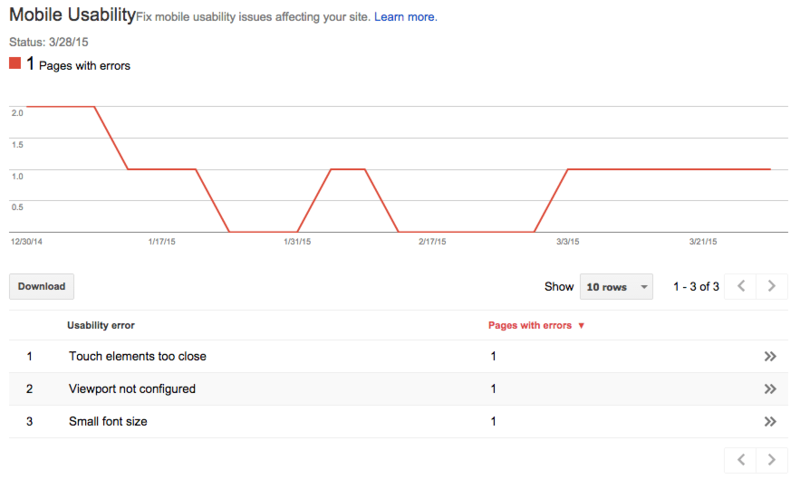 Check your mobile usability stats using Google webmasters tools. You can click these usability errors and go directly to the page with the issue, and see what needs to be done to fix the page, whether it’s as simple as a change in font size or as complex as viewport issues that are preventing the page from adapting to smaller screens. Run through these errors and correct the necessary issues. Skip to step 5. 3. Check with your webmaster or website provider to see the status of your site. If your site is managed by another person or company and you’re getting a red notification from Google, it’s time to give them a call and see what you can do to get your site upgraded to a mobile-responsive theme. If your provider isn’t able to build mobile-responsive websites, move on to step 4. If you’re able to get upgraded, do it. In this case, change is good. After your site has been updated, skip to step 5. 4. Find a new website provider. Live sample sites demonstrating previous work. It’s a good idea to plug these sites into Google’s Mobile-Friendly Test as well, to check and make sure their designs are as functional as they are visually appealing. No examples to check out? Steer clear. A quality website designer or provider should be proud of their work. Responsive design, not separate sites for mobile devices. Google has stated in the past that it prefers responsive design over other solutions. Experience transitioning desktop websites to mobile-responsive design. Transitioning to an entirely new website design is a lot more complicated than simply changing layouts and images. Redesigning a website can hurt existing search engine rankings if not done carefully. Any links with long-standing high rankings can disappear if a URL structure is incorrectly changed. Inbound links, an important ranking factor, can also be impacted in a redesign. Previous experience transitioning sites is important to retain any existing search authority. Once you’ve found a new website provider or designer who can build your perfect mobile-responsive site, move on to the next step. 5. Test, test, then test again. Once you’ve gone through a site redesign, or any time you make tweaks to your site, it’s important to run through every page of your site and make sure links are working and pages are loading properly. Run through it on a smartphone or tablet if you can, too. Since you’re a real estate professional and not a website designer, it can be tempting to trust that your site is always up and running smoothly, and go days, weeks or even months without actually checking on your site. However, your website is your online representation to potential clients, and it’s important to know it’s up and running and collecting leads. If you check Facebook every day to see what’s going on with your high school sweetheart, why wouldn’t you want to see what’s going on with your business? When you’ve checked through your website and everything is good to go, you can move on to the final and most exciting step. Your site is now mobile-friendly and you can avoid all punishment from Google on April 21. Now, you can focus on adding relevant, local content to your website to climb the search engine rankings even further. What do you think about Google’s algorithm update coming this month? Is your website prepared? Please continue the conversation in the comments section below.